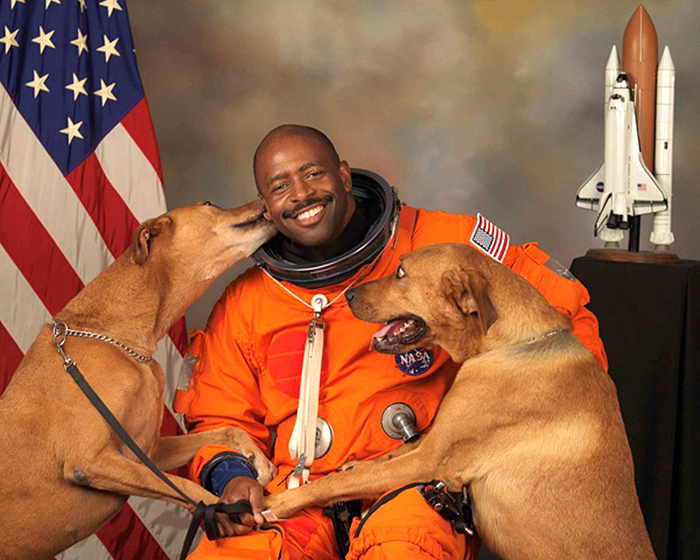 This photograph of NASA astronaut, Leland D Melvin with his dogs Jake and Scout, just brings so much joy to my heart! Being a dog lover, I can just feel the excitement, the love and the happiness both Leland, Jake and Scout are all feeling. Just look at Leland’s smile, then Scout’s eyes nearly popping out of his sockets. Wiki: Melvin began working in Nondestructive Evaluation Sciences Branch at NASA Langley Research Center in 1989. His responsibilities included using optical fiber sensors to measure strain, temperature, and chemical damage in both composite and metallic structures. In 1994, he was selected to lead the Vehicle Health Monitoring team for the cooperative NASA/ Lockheed Martin X-33 Reusable Launch Vehicle program. In 1996, he co-designed and monitored construction of an optical nondestructive evaluation facility capable of producing in-line fiber optic sensors. Selected as an astronaut in June 1998, Melvin reported for training in August 1998. 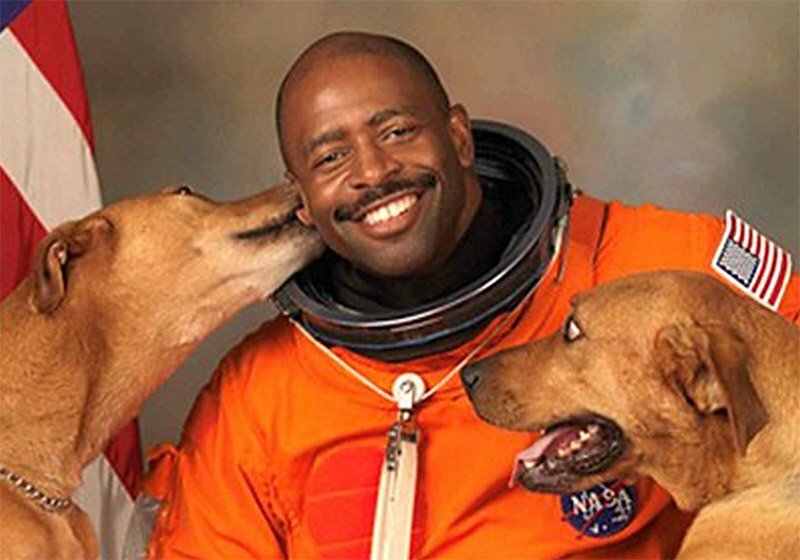 He has since been assigned to the Astronaut Office Space Station Operations Branch, and the Education Department at NASA Headquarters, Washington, D.C. As co-manager of NASA’s Educator Astronaut Program, Leland Melvin has traveled across the country, discussing space exploration with teachers and students, and promoting science, technology, engineering and mathematics. He next served in the Robotics Branch of the Astronaut Office. In October 2010, Melvin was named as associate administrator for the Office of Education. As associate administrator, Melvin was responsible for the development and implementation of NASA’s education programs that inspire interest in science and technology and raise public awareness about NASA goals and missions. He retired from NASA in February 2014.